As we begin 2019, the moment is here to take a general look at the industry, and who better to discuss today’s topics with than Chris Higgins? 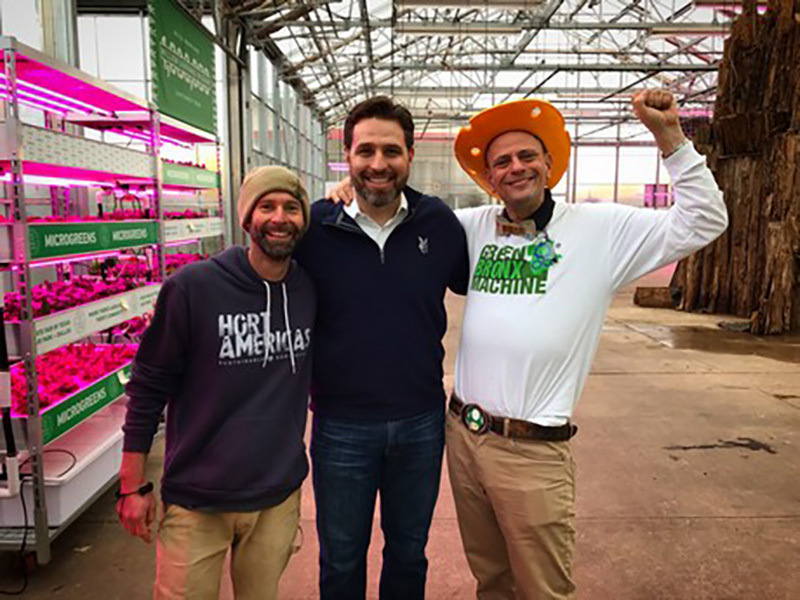 With Hort Americas continually competing to be one of the leading wholesalers in North America, and Chris being a complete horti-geek, he’s on top of the industry’s topics of today and tomorrow. And there’s much to cover at the moment. “For us, Hort Americas, the only constant thing we see is change. Being a wholesaler and being constantly aware of the need to add value to our customers’ businesses, we are focused on finding the winning innovation of tomorrow”, he explains. It’s been almost a decade since Hort Americas was founded. In April 2009, a group of young American entrepreneurs united with the Dutch suppliers of Horticoop and started bringing horticultural products to the quickly growing horticultural industry of the USA and Canada. Operating as a wholesaler, the company made many products accessible to bigger and smaller companies. Within their client base you can find vegetable growers, ornamental growers as well as a wide variety of growers implementing a wide variety of innovative techniques used to produce an even wider variety of crops. However, there are various topics that unite them. “Labor is the number one topic in all the conversations we are currently having. It does not seem to matter if we are talking about commercial horticulture, field agriculture or vertical farming. This trend seems constant. In vegetable production as well as in ornamental horticultural production – the quality, availability and cost of labor is the number one topic in North America”, Chris explains. To the company, being on top of these trends and offering solutions to them is key. It’s not just a vision to Hort Americas. Besides being active continuously in educating growers and researching a lot, the company (which two years ago started their own demo greenhouse) is focused on creating positive change within their community while at the same time improving the knowledge of the Hort Americas team and their ability to communicate that knowledge with both their vendors and their grower partners. When asked why Dallas, Texas, Higgins responds, “We are testing products and trying to prove their value. The hot Texas summers offer a tough and difficult environment to grow in. If we can make it work in Dallas, we are confident in the quality of these products and their abilities to perform in some of the most harsh circumstances.” From their commitment to have a positive social impact to their commitment to playing an important role in both the success of their vendors and their grower partners, Higgins is excited and enthusiastic about the future.Then there’s the social aspect: adding value to the local community. A perfect example of this is Hort Americas’ relationship with Current by GE (LED grow light solutions). Adding lighting to the crop is an important topic for many growers wanting to lengthen their season and increase their production. “This goes for vegetables, but for sure is not exclusive to vegetable crops. Managing light intensity, light quality and photoperiod is important in all crop production. LED lighting has helped everyone from tree nurseries (for example) becoming more efficient in growing maple trees to tissue culture facilities producing ornamental and medicinal crops. “Investing in LED is all about effectiveness and efficiency – making it a perfect Hort Americas product catalog. And the engineering team at Current has helped us to develop a variety of fixtures perfect for many (not all) applications. We are working towards that.” Higgins’ excitement about the GE partnership carries over to other partners that are helping them produce innovative fertilizers and have provided them with opportunities to explore new technologies like 30MHZ (sensor products offering growers a better control and more insights on their crop). Previous post: How do you stop diseases on controlled environment edible crops? Next post: What is the impact of LED grow lights on indoor horticulture crops?